Countless research reports and case studies have shown that social media is not just important, but is essential to the success of your brand today. It’s rapidly evolving, with new channels and concepts continually emerging that vie for the attention of both consumers and marketers. Why does social media deserve to be a top priority for brands of every size and scope? For one, it has overwhelming influence on most demographic markets and often drives purchase, brand loyalty, and social advocacy. Secondly, research shows that people are spending more time than ever on social media, so these channels offer unlimited exposure and reach to existing customers, new target audiences, and untapped markets. And lastly, and possibly most importantly, it’s likely that most or all of your competitors have a social media presence and following, which could put them at a major advantage and cost your company customers, revenue, and brand position every day. If you attempt to have an in-house social media coordinator handle all of your brand’s social media marketing on their own, you may be shocked to find that they’re in way over their head. Why? An internal may be inexperienced and overwhelmed by the abundance of social platforms, and unaware of which are best for your brand, which could be a costly mistake. They may look at it as a fun job where they get to play on Facebook all day, not realizing that there’s serious work involved. To develop a successful social media presence, you need a strong strategy that’s designed for your marketing goals, brand strengths, target market, and brand image. This is where the expertise of an agency is invaluable. The agency will help you navigate the ever-changing social media arena, as well as develop and execute a social strategy that’s targeted to your brand’s objectives. While there are many reasons an agency is vital for your brand, the five most important are detailed in the new e-book from MDG Advertising, “The 5 Biggest Benefits of Having an Agency Manage your Social Media.” In this eye-opening new e-book, we reveal why using an agency is the most effective and efficient way to manage all of your brand’s social media marketing needs. Time: Social media demands a lot of time, including strategy development, continual content creation, focused execution, and targeted promotion. Frankly, it’s more than one in-house social media coordinator can handle in a day, especially since that individual also may need to devote their time to other tasks. In the e-book, you’ll learn why a highly skilled agency can help to make social media management more effective and efficient. Cost: If you thought social media could cost little to nothing and be wildly successful, think again. Today, a brand needs to invest in paid social media advertising to enable their posts to reach and convert their target audience. This e-book highlights how an agency can provide your brand with the most cost-effective social strategies and save your company the expense of an in-house coordinator. Knowledge: An agency has its finger on the pulse of the latest in social media, along with an extensive knowledge of the savviest tactics and the advanced digital skills to implement a wide range of social media initiatives. Few internal coordinators possess this marketing intelligence, which can cost your brand worthwhile opportunities, market share, and revenue. In the e-book, you’ll discover how a skilled agency has the expertise to help you distinguish your brand on social media. Objectivity: Comments on social media are not always positive and some issues demand quick, objective crisis management. An internal social media coordinator may be too personally involved with the brand to defuse the situation in a calm and responsible way. We show you how an agency has experience in handling these emotional issues and can provide the crisis management skills needed to keep the brand in good standing. 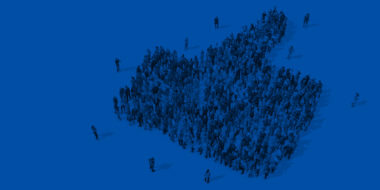 Scalability: No matter how connected a brand may be, it’s unlikely to have developed the strong relationships with social networks or the ability to increase support for more involved social initiatives as an agency has. The e-book details how an agency’s social media experts can help your brand develop and maintain a steady level of performance and handle all social demands with ease. 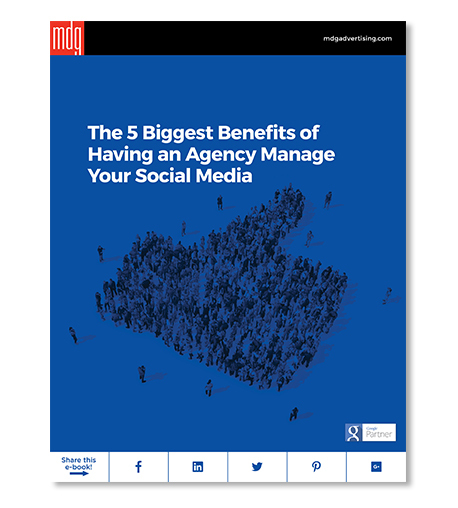 Take a look at “The 5 Biggest Benefits of Having an Agency Manage your Social Media.” to discover all of the reasons an agency is a crucial component of your brand’s social media success. Net greater results and reduce cost through more-effective social media management. Social media is playing an increasingly important role in a company’s overall marketing mix. But have you stopped to consider whether it could be doing more? Even while costing you less? In “The 5 Biggest Benefits of Having an Agency Manage Your Social Media” you’ll quickly gain the information you need to make social media far more effective for your brand. Learn what’s essential in social media marketing. Contact MDG Advertising today at 561-338-7797 or visit mdgadvertising.com.